A medical eye examination includes a number of tests and procedures to evaluate the health of your eyes. These tests range from simple ones, like having you read an eye chart, to complex tests, such as using high-powered lenses to examine the inside of your eyes. 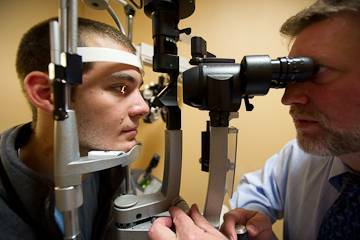 A complete evaluation is called a comprehensive medical eye examination and includes the following services. Common sense, medicolegal requirements, and insurance company regulations demand a reasonably thorough patient history when the patient begins the examination process. The level of patient history that is documented is dependent on the clinical judgment of the doctor and the nature of the presenting problem. This is the act of watching the patient carefully and attentively. This service component provides the doctor with a method to identify the presence of ocular or systemic conditions that may exist without symptoms. Abnormal visual fields are a clinical sign of eye disease. 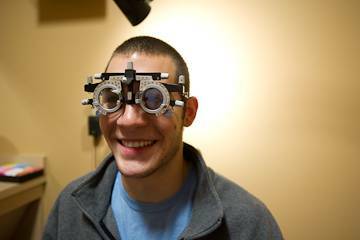 Our office uses automated and manual examination techniques to evaluate your visual field. To have the best vision, it is important for the eyes to work together as a team. We evaluate your sensorimotor system by measuring ocular alignment, extraocular muscle function and your eye’s focusing ability. When medically necessary, a more comprehensive evalution of the sensorimotor system may be ordered to include tests of sensory function, sensory adaptation, and multiple measurements of ocular alignment. The biomicroscope is an instrument that produces a magnified view of the of the structures of the eye. The clinical information gained by performing a biomicroscopic examination is used to evaluate the eyes for signs of eye disease. 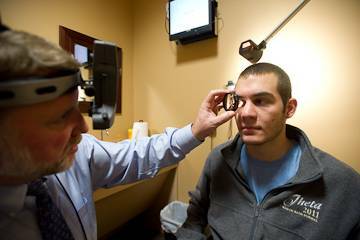 Tonometry is the name for a variety of tests that measure the intraocular pressure of the eye. Abnormal intraocular pressures are associated with several types of eye diseases and obtaining these measurements is a part of every comprehensive medical eye examination. 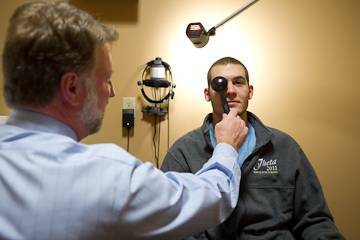 A common method used for tonometry is a non-contact procedure the uses a soft puff of air to measure intraocular pressure. 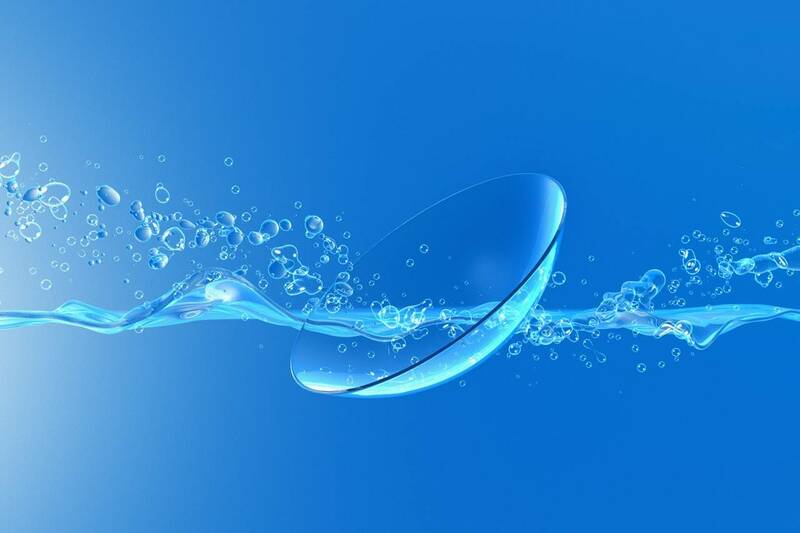 Based on your eye’s resistance to the puff of air, the instrument calculates the pressure inside your eye. Another popular way to measure intraocular pressure is with an instrument called a contact tonometer. Because they touch the front surface of the eye, contact tonometers can sometimes be more accurate than non-contact methods of tonometry. Modern technology like the I-Care tonometer are gentle enough to obtain a contact measurement without using anesthetic eyedrops. Since glaucoma and other eye diseases are often associatd with increased intraocular pressure, accurate intraocular pressure measurements are required to make sure your eyes are really healthy. Your treatment plan should parallel the primary diagnosis. In other words, you should get treatment for the problems you complained about. 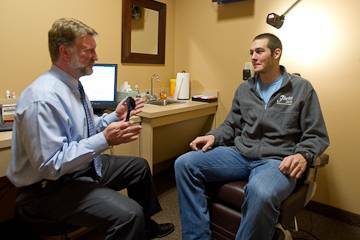 These are the service components of a comprehensive medical eye examination at First Eye Care of Prosper. Depending on your particular needs, Dr. Stiles, Dr. Konvalin or Dr. Surdacki may perform additional diagnostic tests on the day of your examination or schedule you for future follow-up examinations.